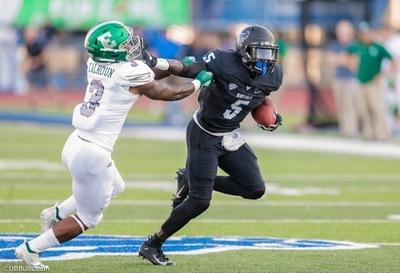 For any follower of UB Bulls football, comparisons to the school’s two alltime leading rushers is a high compliment. But when the next generation of Bulls running backs makes that comparison themselves, and use it for inspiration, that’s a good sign. That’s exactly what fellow freshman RB’s Kevin Marks and Jaret Patterson are doing. Coming off a win over Central Michigan in which both topped 100 yards, the next generation of rushers are in tune with the past, and looking to make it their future. “We push each other every day in practice. I heard someone say that we’re like a duo. That’s exactly what it is. We just want to keep getting better and help this team win,” says the 5-9, 190 pound Patterson, who physically resembles Oliver. The quote above belongs to Patterson, who was in grade school when Starks starred in Amherst, and in high school when Oliver set the school record. Both players are held in high regard for their roles in establishing the UB program and advancing to solid NFL careers. Even after just six games, it is not a stretch to start comparing Patterson to Oliver. It’s not a stretch to Oliver himself. I reached out to the former Charger to find out if he was aware of Patterson’s early season success, and the natural comparisons that fans are making. I found out I was way behind on the story. “That’s my little bro. We put some work in this summer when I was in Buffalo and I text him just about every game. I see a lot of myself in him, but he’s his own man. I’ll continue to pour into him what’s been poured into me and I believe he’ll break my records and the records that are not mine,” Oliver told me. Oliver rushed for a school record 4,049 yards from 2010-1013. Patterson has 299 yards in six games, including 100 yard performances against Rutgers and Central Michigan. While still a freshman, Patterson and his twin brother James arrived on campus in January and both are emerging as key players. “I always play with a chip on my shoulder. Me being a smaller back, I always have something to prove,” says the native of Glendale, MD. 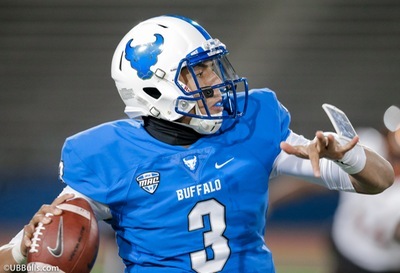 Patterson has one other interesting UB connection. One of his coaches at St. Vincent Pallotti High School is former Bulls linebacker Justin Winters, who led the team in tackles during the 2008 MAC Championship season. Marks is off to even better start. His 474 yards lead the team, and rank third in the MAC. His seven touchdowns lead the conference. Against Central Michigan, Marks’ 167 yards were just three shy of the school’s single game freshman record. He has the long stride, breakaway speed and power that Starks displayed when running for 3,140 yards from 2006-2008. His 70 yard touchdown run featured a powerful stiff arm. “It really has to do with your pad level, getting low, getting leverage, taking on the contact, and breaking off that and running hard,” says Marks, from Norfolk, VA.
Starks played seven season with the Green Bay Packers. The Niagara Falls native retired following the 2016 season. Marks and Patterson didn’t figure to see much action this year. Last year’s starter, Emmanuel Reed was returning. So was top backup Johnathan Hawkins. But from spring workouts to the preseason, Head Coach Lance Leipold knew both young backs would force their way into the lineup. Starks and Oliver never played together. With both Marks and Patterson each having three years left beyond 2018, the true battle may be not whether they can equal the careers of the two Bulls legends. It’ll be to see which one breaks their records first.